Lady Liberty of Cedar Rapids, the second largest city in Iowa. The replica is part of the 40th anniversary theme of the Boy Scouts of America's: “Strengthen the Arm of Liberty”, 200 small versions of the Statue of Liberty were placed in communities across the country in the early 1950’s. Where in the United States is Iowa? Location map of Iowa in the US. Iowa is a landlocked Midwestern U.S. state, bordered by Minnesota to the north, Missouri to the south, and South Dakota to the north west. In west the Big Sioux River marks most of the border with South Dakota, then the river joins the Missouri, which constitutes the entire section of the state's border with Nebraska. The Mississippi River defines Iowa's eastern borders with Wisconsin and Illinois. In colonial times, Iowa was first part of French Louisiana and later part of Spanish Louisiana, when Spain acquired the more or less uncharted territory from France. But Spain was slow to take actual possession of its newly acquired colony and French colonists were upset and even resentful to the idea of Spanish rule. So, the Spaniards had a problem with this property, many of the colony's officials were either French or of French ancestry. Eventually, Spain returned the territory back to France, just three weeks before the French sold the region to the United States for $15 million, the deal is known as the Louisiana Purchase. After the Louisiana Purchase, first American settlers moved to Iowa in June 1833, people and families from Ohio, Pennsylvania, New York, Indiana, Kentucky, and Virginia in search for new frontiers. Sunset over Big Woods Lake, as seen from the Big Woods Lake Campground in Cedar Falls, Iowa. In 1838, the U.S. Congress established the Territory of Iowa (Population 23,242). 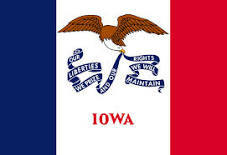 Eight years later on 28 December 1846, Iowa became the 29th state in the Union. Short after admittance to the Union, Iowa organized campaigns for settlers and investors, boasting the young frontier state's rich farmlands, with fine citizens, a free and open society, and a good government. 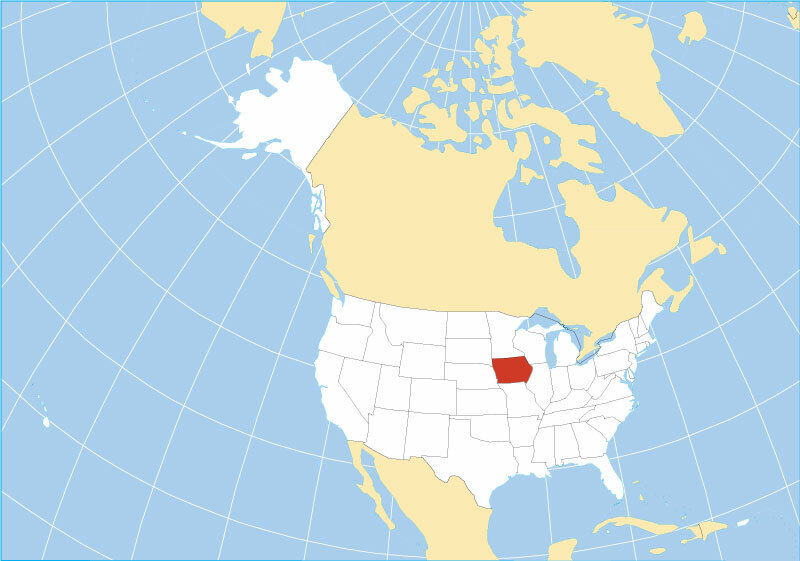 Iowa covers an area of 145,746 km² (56,272.81 sq mi) , compared it is slightly larger than Greece. Compared with other US states by area, Iowa is 6.5 times larger than New Jersey, but it would fit into California almost 3 times. Broken Kettle Grasslands, the region is known as the Loess Hills, a formation of wind-deposited loess soil in the westernmost part of Iowa and Missouri along the Missouri River. Broken Kettle Grasslands is home to Iowa's largest remaining prairie, including some 170 bison. 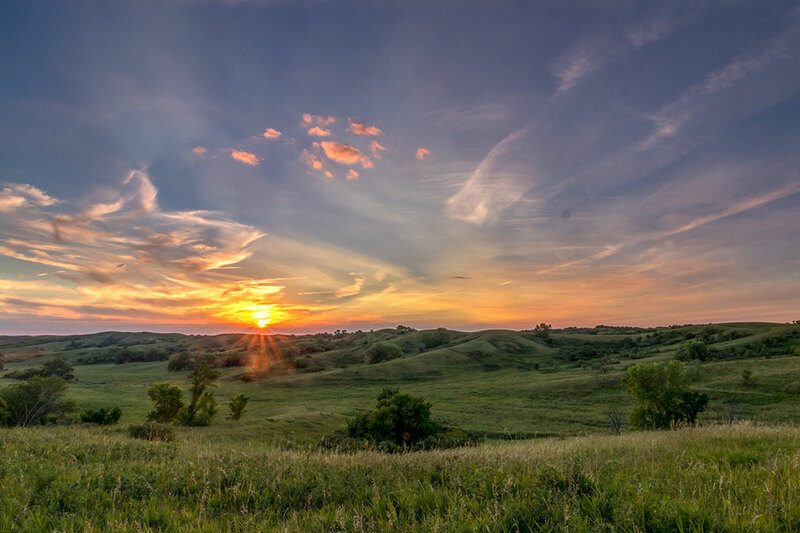 The 'Land of the Rolling Prairie' offers rolling prairies and cornfields, steep hills and valleys in north. Most of Iowa's land is used for agriculture; crops cover about 60% of the state, 30% is grasslands (pasture and hay with some prairie and wetland). Highest natural point is Hawkeye Point at whopping 509 m (1,671 ft). Situated close to the state line with Minnesota in north west, north of Sheldon. The hill is easy to find, there is a flagpole, a picnic bench, a tile mosaic, and several granite markers. 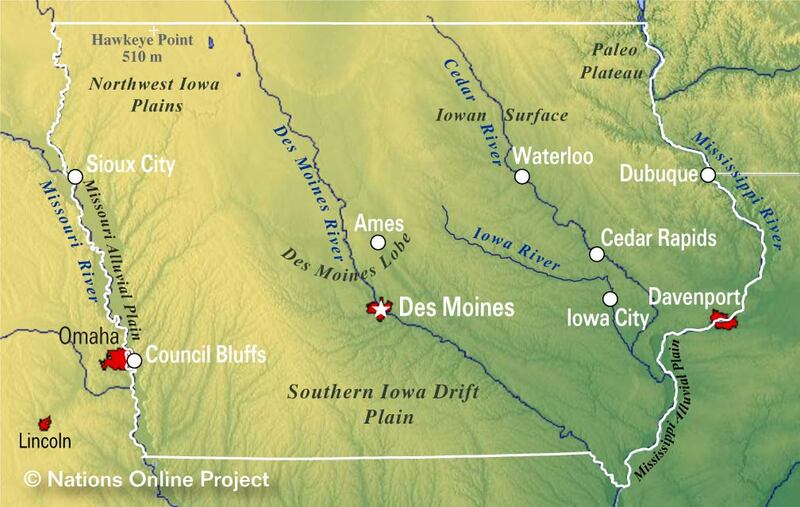 The Missouri River and the Mississippi are border rivers which defines Iowa's border in west and east. Other major rivers are the Des Moines River, the Cedar River, the Iowa River, and the Wapsipinicon River (Wapsi) are all tributaries of the Mississippi. The Big Sioux River, in northwest is a tributary of the Missouri River, it marks a section of Iowa's border with South Dakota. The Chariton River and the Grand River have their sources in Iowa. Largest lakes in Iowa are Lake Red Rock, a reservoir on the Des Moines River; and there are Iowa's Great Lakes, several deep glacial lakes in the northwest corner of the state, they are the largest natural lakes in the state; Rathbun Lake, Iowa's second largest lake is located in Appanoose County, West Okoboji Lake and Spirit Lake, are the two largest lakes of Iowa's Great Lakes, Saylorville Lake, another reservoir on the Des Moines River. 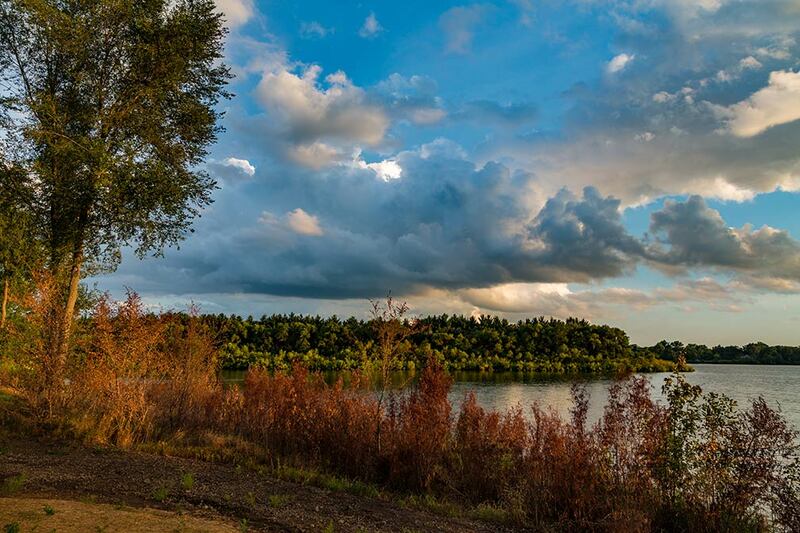 Clear Lake is one of the largest natural lakes in the state. 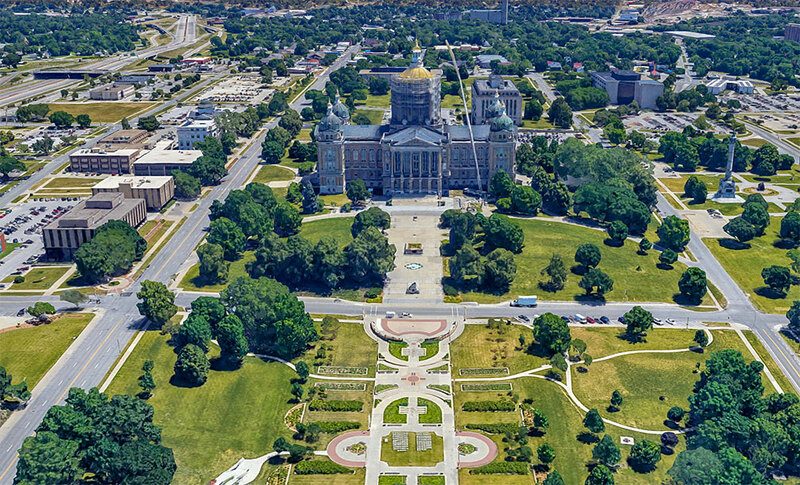 Rendered image of Iowa State Capitol in Des Moines. The modified Renaissance style building is the seat of Iowa's General Assembly. Today, Iowa has a population of 3.18 million people (est. 2018) , capital and largest city is Des Moines, other major cities are Cedar Rapids, Davenport, and Sioux City. The two busiest airports in the state are Des Moines International Airport (IATA code: DSM), and Cedar Rapids' The Eastern Iowa Airport (IATA code: CID). Second largest city is Cedar Rapids (pop. 131,100), other major cities are: Davenport (100,000), Sioux City (83,000), Iowa City (74,400), Waterloo (68,000), Ames (66,200), West Des Moines (64,560), Council Bluffs (62,500), and Dubuque (58,500). Downtown Des Moines as seen from the top of the Iowa Capitol Building. Ankeny, Atlantic, Bettendorf, Boone, Burlington, Carroll, Cedar Falls, Centerville, Chariton, Charles City, Cherokee, Clarinda, Clinton, Creston, Decorah, Denison, Emmetsburg, Estherville, Fairfield, Fort Dodge, Fort Madison, Grinnell, Indianola, Iowa Falls, Keokuk, Knoxville, Le Mars, Maquoketa, Marion, Marshalltown, Mason City, Mount Pleasant, Muscatine, Newton, Osceola, Oskaloosa, Ottumwa, Red Oak, Sheldon, Shenandoah, Spencer, Spirit Lake, Storm Lake, Urbandale, Washington, Waverly, and Webster City. 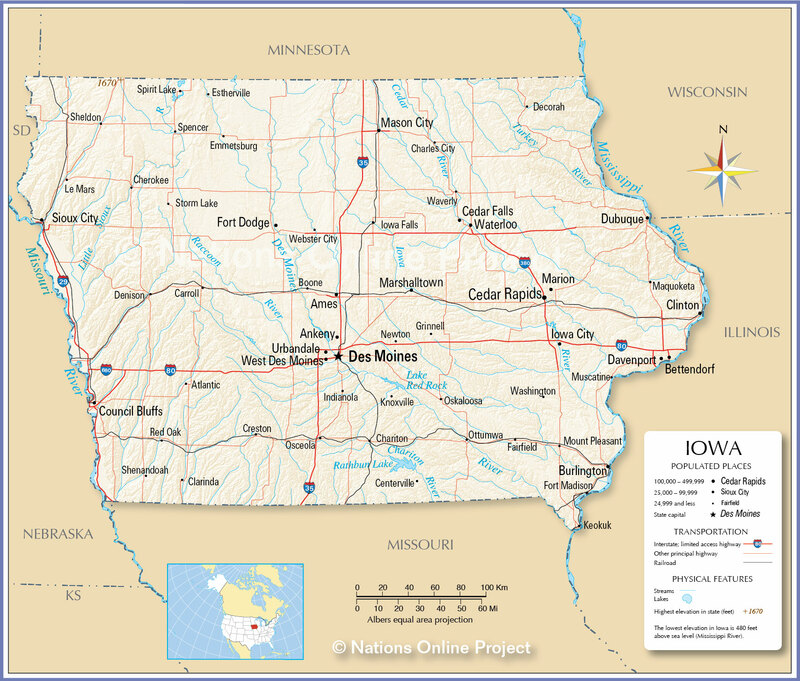 The detailed map shows the US state of Iowa with boundaries, the location of the state capital Des Moines, major cities and populated places, rivers, streams and lakes, interstate highways, principal highways, and railroads.